So, what should I say? Genious and madness lie close together. 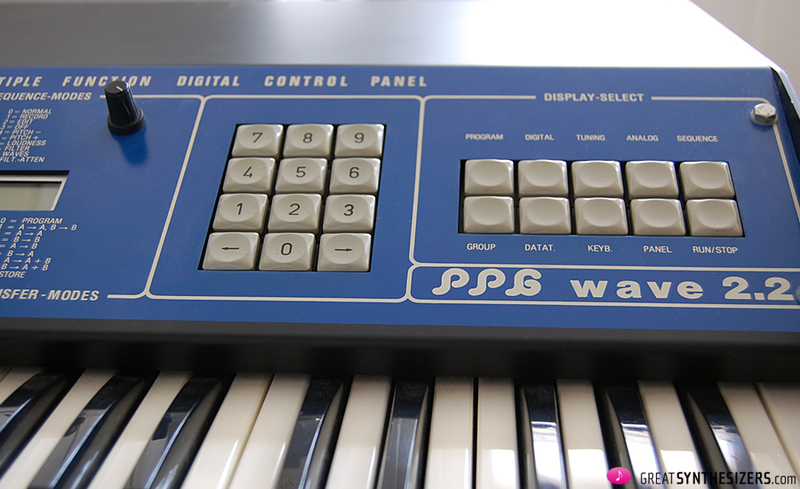 In other words: the PPG Wave 2.3/2.3 synthesizers can be seen either as a benefit or a disaster. You decide whether they are a problem or a source of musical enrichment. 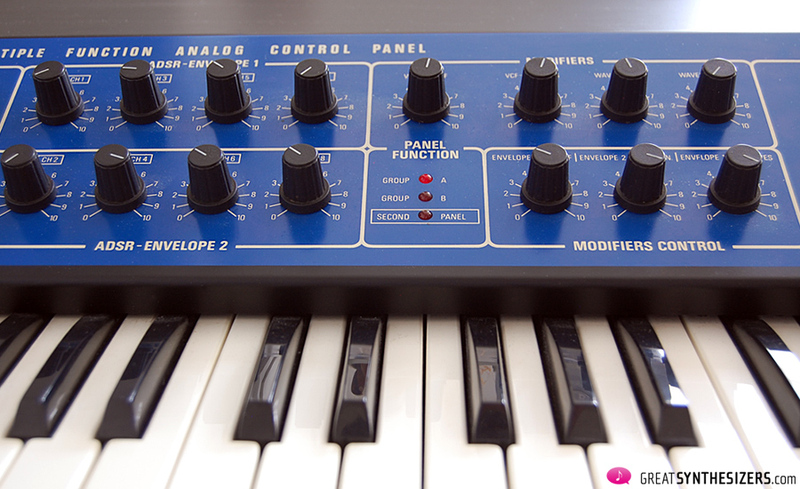 Wave 2.2/2.3 are hybrid synthesizers (digital controlled instruments with – in this case – analog filters). They offer 8 voices with 2 oscillators each. 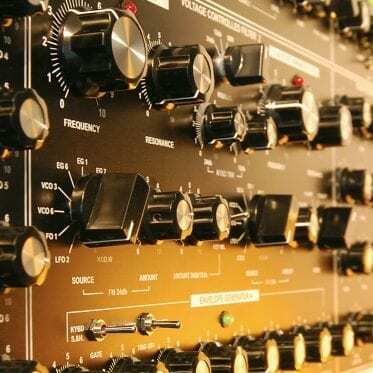 The OSC themselves feature not only ordinary waveforms such as saw, pulse, etc., but complete wavetables. There are 32 of them are at your disposal, each consisting of 64 waveforms. 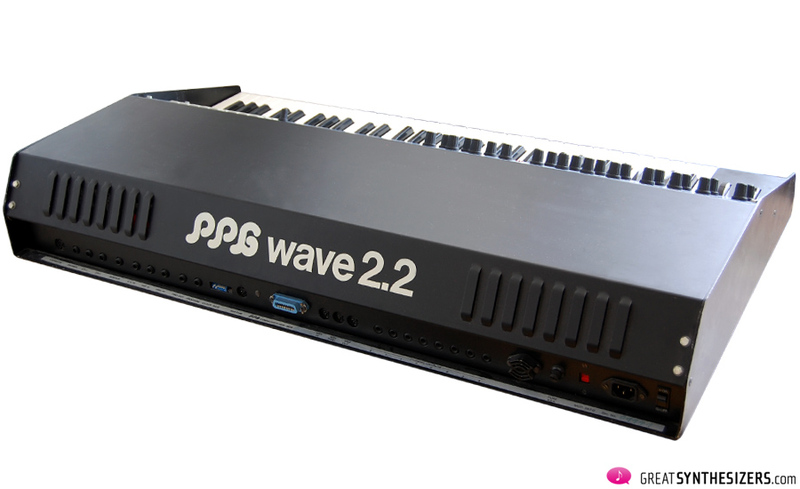 Running through the wavetables generates the typical PPG-sound – full of dynamic and unusual musical textures. 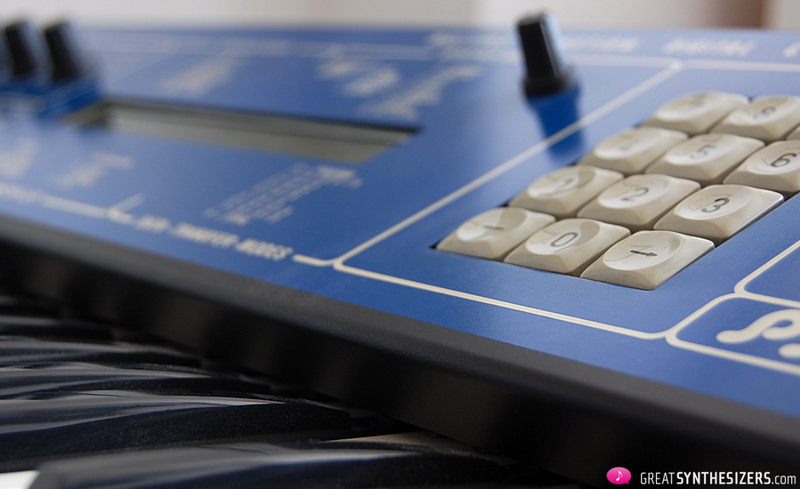 The wavetable-concept was extremely unusual when developed and released end of the 70s, beginning of the 80s. 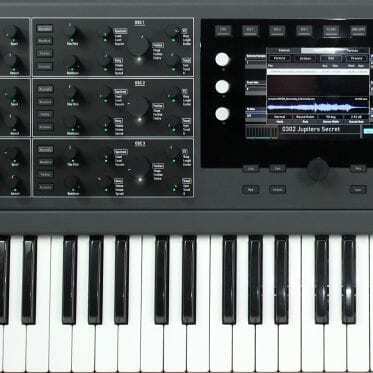 Even today, the PPG Wave-instruments are exotic synthesizers, since 90% of all synthesizer concepts utilize the callsic samples or waveforms to build up their sounds. Featuring real analog filters, PPG Wave 2.2/2.3 are capable of surprisingly warm sounds. 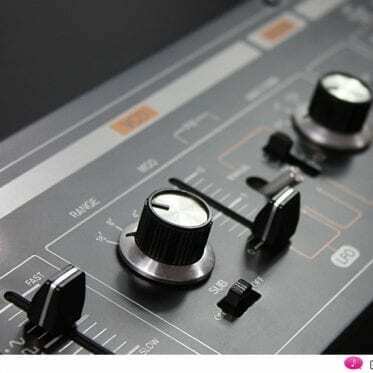 However, the overall character of the instruments either digital, or a mixture of both analog and digital. One crucial point is the user-interface. 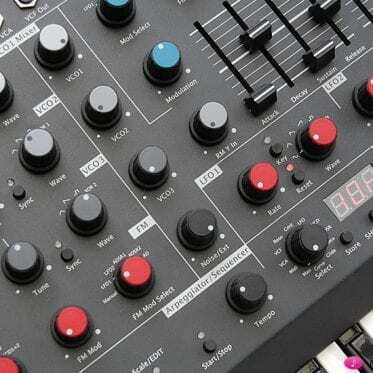 The general concept is interesting: a mixture of analog parts (very nice knobs!) with digital controls. 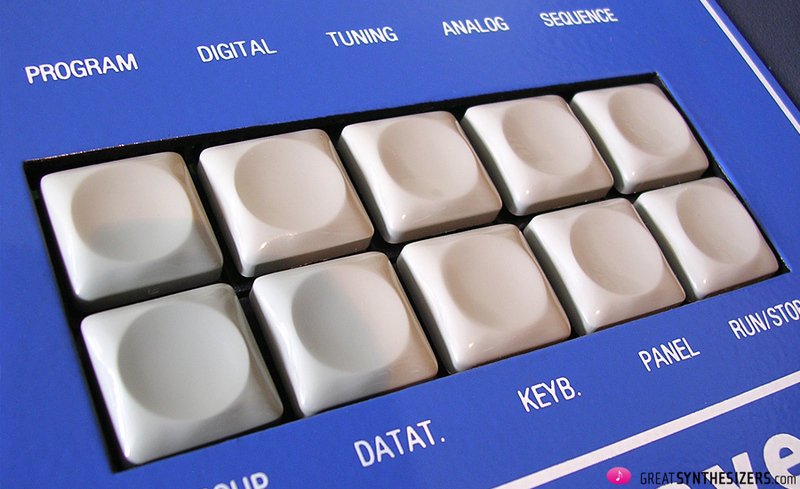 Most programming will be done via the digital key pads. This is the point where things get weird: if you step through a page with the > key, there’s an end to the menue. Hit > once more and you’re at the beginning again (now activating the preset number, which is always in first place). Ok so far. Now press < once more to get back to the end of the page (let’s imagine you simply forgot to do a little programming) – oh dear, it doesn’t work! Instead, you have to press > another 10 (12?) times, jumping all the way to the one feature (at the end of the page) you want to programme. Not really intuitive, honestly. Those PPG sounds created with well-programmed wavetable-modulation-routings are just brilliant! 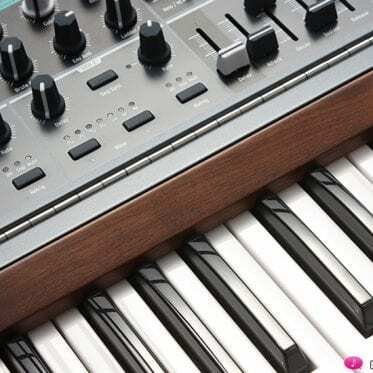 Controlling the instrument via MIDI offers additional possibilities, as the computer might control pitch-wheel-data and other modulation source adjustments, influencing the wavetables while you turn and push the buttons and controls. Controlling Wave 2.2/2.3 via MIDI is (more or less) no problem! Not to be taken granted with an instrument of that age. Hermann Seib improved the Operation System (last version: 8.3), so implementing this software might not be a bad idea. Another important aspect: ultra-fast envelopes. They really sound meaty with their aggressive attacks. Together with the analog filter, you end up with some totally analog sounds. Remember: (digital) wavetables are the instrument’s sonical basis. Just imagine how powerful the PPG Wave can sound with ultra-fast envelopes and analog filters. I like the atonal idea a lot. Open the TUNING page, move the cursor to voice 1, then hit 8 different keys (black and white keys) all across the keyboard – and that’s it! You’ve programmed the PPG Wave into a totally non-harmonic, weird scale. Keep on playing – those atonal results will surprise you! (Total) TUNE = 440Hz is to be found on the main page. 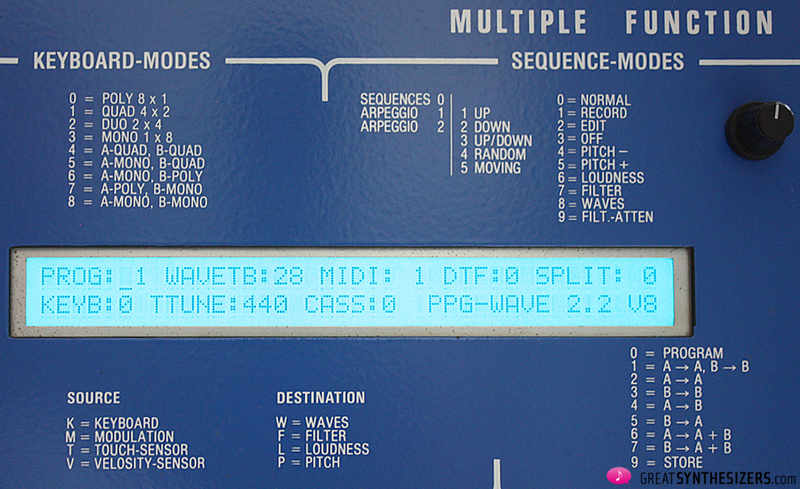 The display shows the current PROG number, the selected WAVETB, the active MIDI channel, DTF (DataTransFer – codeword for the internal Dataflow), SPLIT, KEYB (Mode), TTUNE, CASS and – last but not least – the current OS: PPG-WAVE 2.2 V8. As you see, PPG means lots (!) of numbers and abbreviations. The keyboard is clunky, hard to play, no fun … A keyboard upgrade might help remedy the disaster. This can be a rather simple upgrade, with wire, glue and felt. But it helps to equal the independant key’s height, and to stop clunky noises (created by worn-out rubber inside the keys). 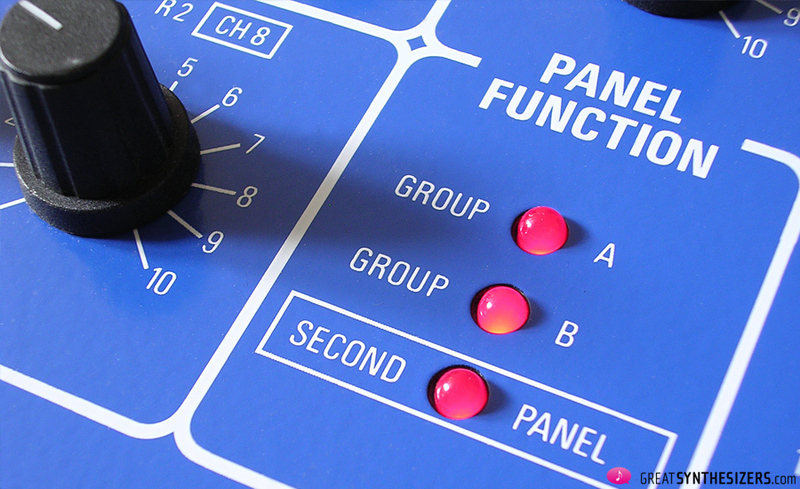 Ah yes … don’t panic: When using aftertouch, the whole (!) 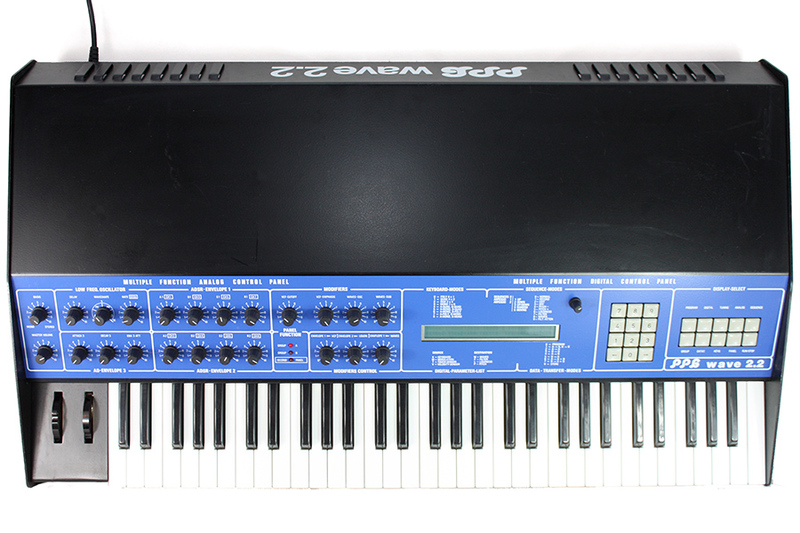 keyboard moves down … quite unusual, as the keys wobble up and down all the time when playing. Wave 2.2 / 2.3 each offer a vast row of connections. 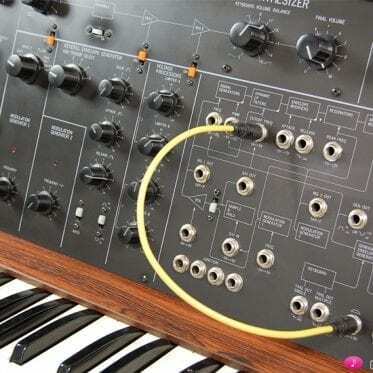 I never have been successful controlling the instrument via CV/Gate (analog sequencer). 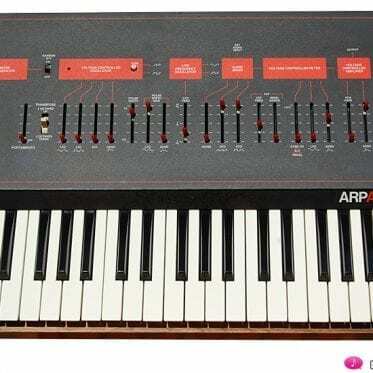 Going through the user’s manual you think “wow, that’s the perfect synthesizer” – but in reality many features don’t really work out that well. (Since MIDI works perfectly, this is no real problem. However, in my experience, working with analog sequencers is far more creative than sitting in front of a computer trying to bring out those shuffling arpeggios …). CV/Gate has never worked on my PPG. Sadly, these waveforms DO NOT fit to the rest of the wavetable, musically speaking. Usually you have very soft, round, organ-like waveforms. And you glide through the waves manually, or with the help of a modulation source. Everything is perfect until wave no. 60 turns up and destroys the mellow, smooth sound-scape … it’s totally frustrating, as you have to figure out the perfect modulation depth ending below these classic waveforms, below no. 60. That’s only possibly with trial and error (there is no other way) and costs a lot of time and energy to get those smooth wavegliding sound you’re looking for. PPG Guru Herman Seib has made many improvements on the PPG operating system during the last decades. The latest version OS 8.3, available at Virtual Music, is highly recommendable. “V8.3 is the consistent development by Hermann Seib of his successful V8.0. 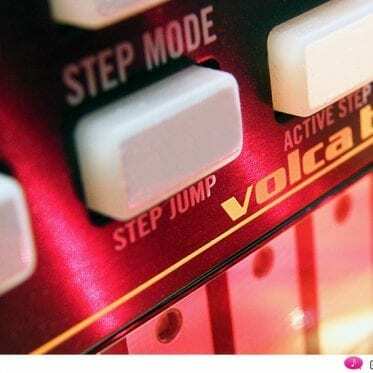 Like V8.0, the new V8.3 system offers comprehensive SysEx support which allows saving your own sounds via MIDI to an external computer device. Formerly this was only possible with an expensive Waveterm computer device. 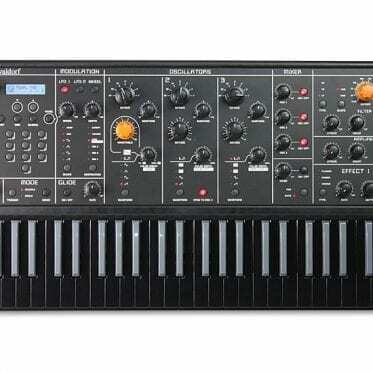 Via MIDI SysEx datagrams the PPG synthesizer will communicate with an external MIDI library, like the Emagic SoundDiver. 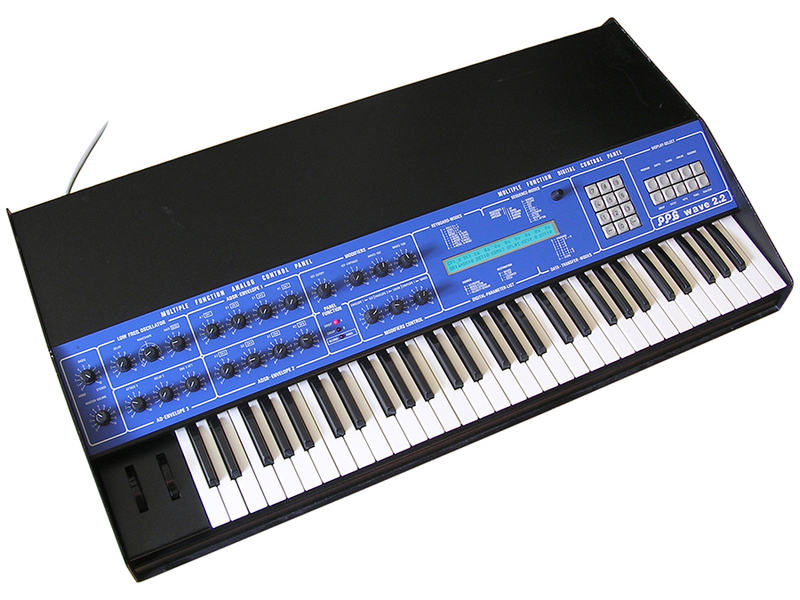 Wave 2.2 / 2.3 synthesizers have been always luxury instruments, expensive to buy, long-winded to operate, and unpredictable. Anyway, you can make much more radical timbre changes using PPG-style wavetable synthesis than with purely analog (or purely digital) techniques. That’s the good point. In fact, Wave 2.2/2.3 are lovely instruments – if you’re patient, willing to accept some minor software bugs and (possibly) irritating user-interface stuff. Understanding and – more important – accepting the instrument’s peculiarities will take some time, but your reward will be unique musical experiences. 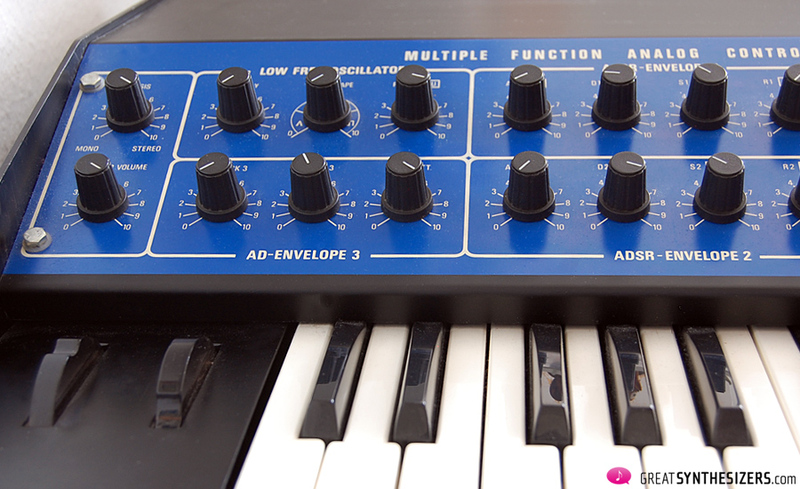 In today’s market, quite a few instruments offer PPG-like synthesis techniques. First, there’s that whole bunch of Waldorf synthesizers: Microwave, Wave, Blofeld, etc. 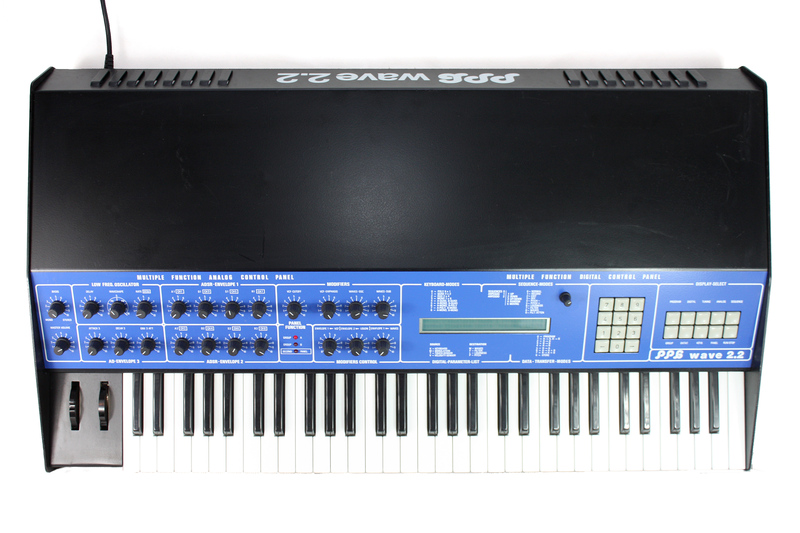 Second, those (vintage) Ensoniq synthesizers (VFX, SD-1, etc.) allow waveform modulation – with similar results as the PPG. 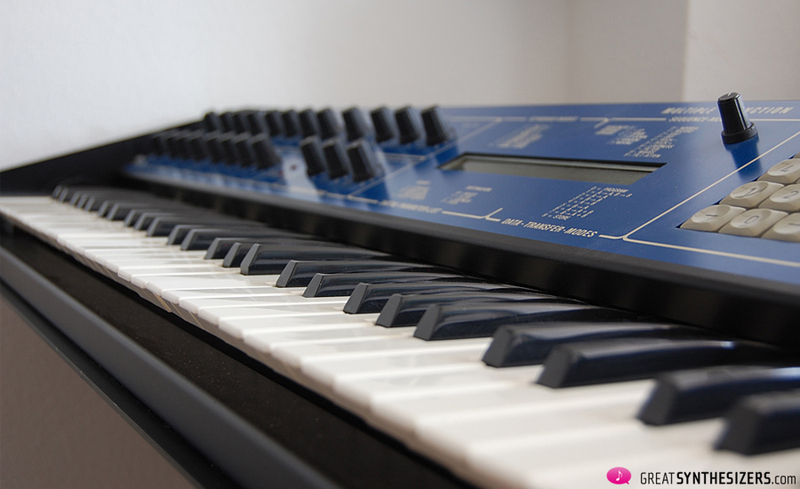 Third, John Bowen’s Solaris synthesizer contains the vast Waldorf wavetable engine. Fourth, Studiologic Sledge. 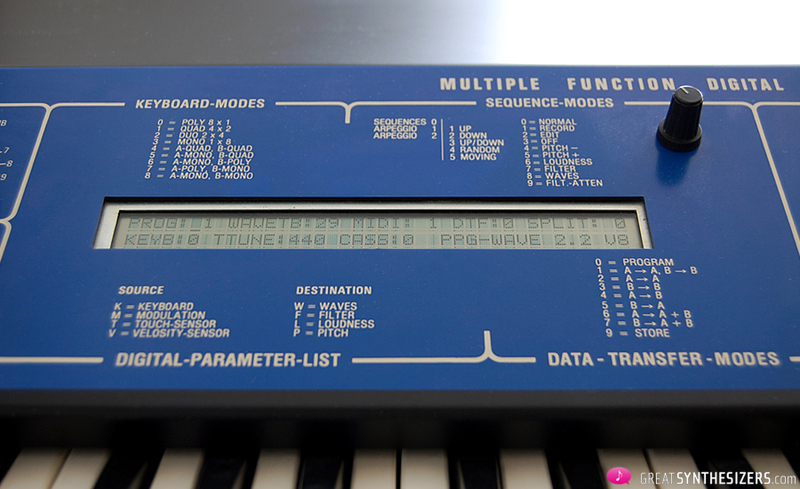 Fifth, there’s the unique MonoWave synthesizer (designed by Paul Maddox). 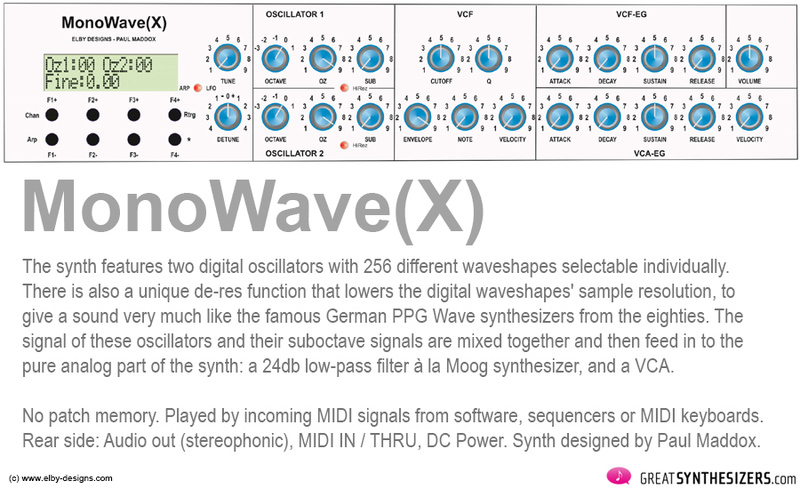 The MonoWave, now called MonoWave(X), is now available again – see www.elby-designs.com for details. 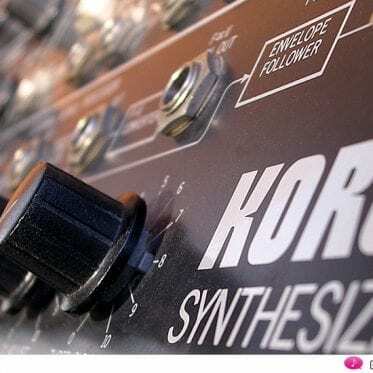 Dozens of synthesizers offer wavetable synthesis these days. They are usually great instruments, most of them powerful machines in their very own way. But, interestingly enough, none sounds like a PPG Wave.